Former Nigerian President Goodluck Jonathan with newly sworn-in President Muhammadu Buhari during his inauguration ceremony on May 29, 2015. Public Domain photo from the US State Department. Palpable hope swept across the continent following the inauguration of Muhammadu Buhari as Nigeria’s president on May 29, 2015. President Buhari defeated the incumbent, Goodluck Jonathan. Not only was this unusual, but the attendant concession of defeat by Goodluck was a new one in a continent saturated by sit-tight leaders. However, there is another element – albeit still untold – of this election: the social media story. President Jonathan took the shine off the IBB [Ibrahim Babangida] presidential declaration in Abuja by choosing that morning to announce his own bid on Facebook. Ibrahim Babangida launched a YouTube campaign video, and had an aide boast that he had become an avid Facebooker. Social media has globally become one of the most important tools for candidates during election campaigns — and Nigeria's race was no exception. Cynthia Mbamalu, programs manager at Nigerian youth charity YIAGA, said platforms like Twitter and Facebook helped the Buhari campaign to reach population pockets that they could have otherwise missed. 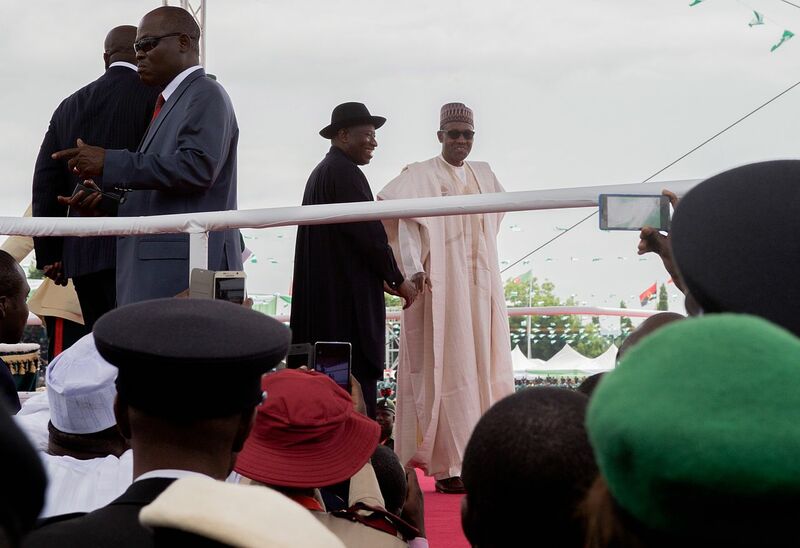 Twitter became a battleground for supporters of the two main presidential candidates, Buhari and Jonathan. The “war” was atrocious and divisive with each party dug in firmly in their respective trenches. Those who were indifferent watched keenly and later made up their minds. Fencism is not neutralism! I have my political bias but I will not be bullied into displaying it on Twitter. Fencism is objectivism, realizing that both candidates have their flaws and not turning a blind eye – as many do – on them. Fencism is having the courage to tweet for and against any of the candidates. Not being held under the fanatical slavery of ‘my candidate better pass your candidate’. Fencism also means that I will vote on that day but will not waste my precious time only tweeting about the elections. This stance was contentious as some Twitter users thought it was hypocritical and a cover-up for hiding entrenched political bias. No matter the perspectives, it is a hard fact that the social media proved handy in bringing anxious Nigerians up-to-speed with the voting outcomes. From Facebook alone, many became certain of the direction the wind would blow, well ahead of President Jonathan’s Tuesday evening concession of victory to Gen. Muhammadu Buhari, and Prof. Attahiru Jega’s early Wednesday morning election returns. Besides the campaign rants and mobilization that was present on the Nigerian blogosphere, this election also witnessed a cross pollination of news from social media to mainstream media. Since netizens offer more opportunities of immediacy, the Nigerian mainstream media had to play catch up many times. This was one Nigerian election that was decided largely on account of propaganda and messaging! The [opposition] APC’s “change” message was compelling and the campaign stayed on message throughout the campaign. This effective message was complemented with devastating deployment of propaganda, often false or contrived but which most voters believed. President Jonathan’s and [the People's Democratic Party]’s communication machinery was in response hapless! A […] ruling party could be so completely incoherent in its communication that it soon became portrayed in the media (and sometimes in its own mindset) as a de facto opposition party. The election also marked the coming of age of social media as a critical force in Nigerian politics, for good or bad! It is regrettable that the popular social media platforms like FACEBOOK, TWITTERS, and INSTAGRAM among others have become potent weapons for near diabolical attacks targeted at political opponents as Nigeria prepares to hold one of the most contentious general elections in over five decades or indeed since after Nigeria gained her so -called flag independence from the British overlords in 1960. The 2015 General elections have been turned into a theatre of hate speeches and campaigns colored in a form that defies logic and common sense. Various politically motivated hate speeches about various candidates and especially the two leading Presidential candidates of All Progressives Congress and Peoples Democratic Party have been bandied. I am sure if experts should collate analyses of contents of the social media this year, Nigeria will rank tops because arguably more than 40 million young Nigerians who have since graduated and have no means of livelihood have found solace in the various social media platforms and are busy churning out divergent messages. Nonetheless, the truth is that Nigeria’s social media ecosystem has undergone an amazing transformation over the years. Whether or not it evolves into a platform that propels or hinders change is a story for another day. What is obvious is that henceforth, no Nigerian politician can afford to run for a national election without sharpening his social media presence and/or engagement.